Here’s Broadbeach resort accommodation you should consider if you are travelling to the Gold Coast for a holiday by the sea. The Sandpiper Beachfront Apartments on Broadbeach are the perfect Gold Coast business accommodation. Our spacious fully self contained one and two bedroom apartments offer couples and young families with everything they need for comfortable and convenient accommodation on the Gold Coast. 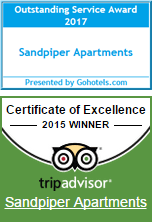 All Sandpiper Beachfront Apartments offer full laundry facilities with ironing equipment. Our large living and dining areas includes a private balcony that has superb views of the park and ocean across the road. Wi-fi is included, along with Foxtel for your nights in. The generously-sized kitchen with fridge, microwave and dishwasher helps to make meal preparation a breeze. Visitors to the Gold Coast will also enjoy the park lands of Kurrawa Park and Pratten Park. Easy access to with public BBQs, covered children’s playgrounds and play areas, walking and cycling pathways, toilets and changing facilities means you get so much more out of your Broadbeach resort accommodation. The Sandpiper Beachfront Apartments on Broadbeach is the perfect place to holiday. Book now.